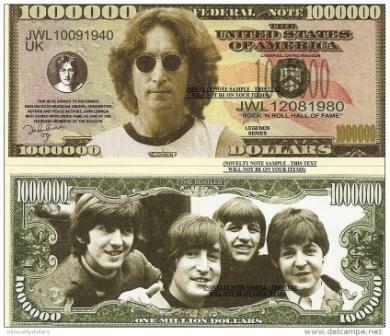 John Lennon - Million Dollar Bill Novelty Bill Collectible. Each bill is printed realistic on two sides and is the actual size and feel of real currency. They are finely detailed and colorful on both front and back with high quality printing. Makes a great gift, collectible or frame and display. Price listed is for 1 bill. Each John Lennon bill comes in a rigid top loading plastic currency holder for safekeeping.